Big epic dark heavy and soul shaking. 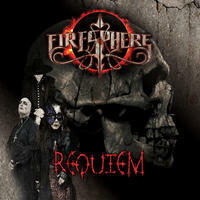 Requiem is the debut album by the epic band Firesphere. In essence it is really a dark gothic love story. Together, the twelve songs on the album tell the tale of its two main characters, the immortals Priest and Rosemary Butterfly, who's undying love for each other is the only thing that keeps their ancient hearts from turning entirely black. Together, they created Firesphere in the 21st Century as a vehicle to tell their epic love story. The music on Requiem is new and exciting, a sound all unto itself. Refusing to follow trends or formulas, they have instead fused industrial metal/rock with techno and epic cinematic soundtracks to create a sound quite unlike anything in the market today, a sound that is fresh and different. As Priest likes to say . . . Feed your hunger! License Big epic dark heavy and soul shaking by Firesphere for your project. Play the music of Firesphere in your restaurant or store.